Getting a new dog is an exciting time! For many dog owners, an important element of this transition is introducing the new addition of the family to an already established furry member of the household. With the right knowledge, this process can be smooth for everyone involved. When bringing a new dog into the family, it is always best to start outside. A fenced in yard is a great place to begin. If you have another dog, let the two dogs have plenty of space, with both dogs on leashes. It is good to let the dogs smell each other, and, if they seem up to it, to let them walk around together. Make sure the dogs are able to get to see and smell each other from all sides. If that goes well, try bringing them inside. Now that the two dogs are inside, a great exercise is to have them be able to smell each other up close and personal, but with a barrier. If your pet is comfortable with this, bring the dog that was already in the house into a room you can close the door to like a bathroom. Then have the two dogs smell each other through the space between the door and the floor. This is a great way for them to get used to the idea of sharing space, while keeping things safe just in case. With close monitoring, dogs can become fast friends. If they do not get along too well, keeping them in separate areas of the house until they get more used to each other is also an option. Another tip is to take a sock or washcloth and let one pet hang out with it for a while. Then give it to the other pet for them to get used to the smell. 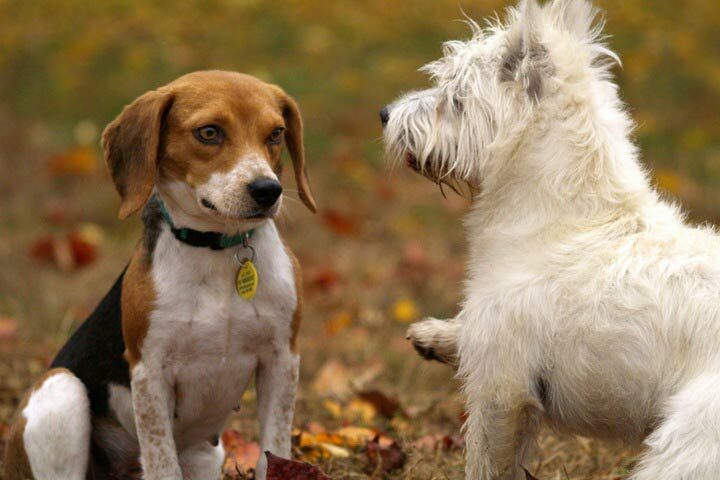 This can help your new pets get to know each other before they even meet for the first time. Exchanging toys between the two pets is also a great way to have them start getting used to the idea of playing together. They will be happy to remember the smell from their toys later when they meet! Things can get a little different when cats get thrown into the mix. The above techniques work well, but really what works best in this situation is time. At first, keep dogs on leashes while greeting cats. Cats will hold their own and set boundaries, so as long as your dog is not too aggressive, they will come to terms on their own time. Many cats won’t be over joyed by a dog’s presence in their home, but they usually come to tolerate them. Be careful for dog’s body language around cats—if they look like they are in hunting mode, you might want to reconsider the relationship. When introducing new pets to each other, it can be beneficial to keep one of the pets confined to one area via a closed door or baby gate while letting the other have free roam of the house, switching periodically. This helps the pets get used to the idea of there being another animal in their area. When you notice that the pet is no longer constantly sniffing around for traces of the new animal, that is when you know it is a good time to start letting them hang out together, monitored of course. Pay attention to the small details when it comes to introducing new pets. Your dog or cat may seem fine, but pay close attention to their eating and bathroom habits. Sometimes pets can express their stress in strange ways like not eating or having diarrhea. Make sure that everything is going normally. One of the most important things when matching pets is making sure that their personas will mesh. If you have a very overactive pet, don’t choose an elderly or slow companion. Many adoptable pets have already been in homes with other animals before. This can be very helpful in easing the transition for the pet you already have. If all this goes well, it is time to start letting your pets have unmonitored time together. Still be on the lookout, but with everyone calm and happy, pets can be very happy to have companions when you’re not around. Always monitor the demeanor of your pets, and if things start to change, separate and slow down the introduction process. Soon you will have an even bigger family of furry friends to love!